The shuttle Atlantis (foreground) sits on Launch Pad A and Endeavour on Launch Pad B at NASA's Kennedy Space Center in Florida. For the first time since July 2001, two shuttles are on the pads at the same time. Endeavour will stand by in the unlikely event that a rescue mission is necessary during Atlantis' upcoming mission to repair the Hubble Space Telescope, targeted to launch Oct. 10, 2008. NASA has delayed the last shuttle mission to the Hubble Space Telescope until early 2009 inorder to repair a broken device that is blocking the orbital observatory fromsending its iconic images of the cosmos back to Earth, agency officials saidlate Monday. Sevenastronauts were training to launch toward Hubble aboard the shuttle Atlantis onOct. 14 on mission to extend the space telescope?s life through at least 2013,but the unexpectedfailure of a vital data relay system on Saturday will add months of delayto their spaceflight. ?I think it?svery obvious that Oct. 14 is off the table,? NASA?s space shuttle program managerJohn Shannon told reporters. NASA announcedMonday that a device known as the Side A Science Data Formatter failed,apparently for good, late Saturday, leaving the otherwise healthy Hubble withno means of relaying data and observations to scientists back on Earth. The electronicsbox failed after 18 years in service since Hubble launched in April 1990. There is abackup for the unit, Side B, and flight controllers on Earth are working tomake the complicated switch to revive Hubble?s science relay capabilities. Butthe move will leave the telescope without the redundancy to withstand anotherfailure should one occur, making a repair for the Side A string vital, missionmanagers said. ?We do notreally understand the precise location of the failure inside of the ScienceData Formatter,? said Preston Burch, NASA?s Hubble program manager at theGoddard Space Flight Center in Greenbelt, Md. ?And we won?t until we bring itdown to the ground.? NASA doeshave a spare unit at Goddard, but will have to put it through a series of teststo ensure it is in good health. Burch saidthat there is high confidence that the spare box, which is relatively brand newdespite being 18 years old, is viable for the Hubble repair. But the testsrequired to prove its spaceworthiness will take months. ?I think we?dbe hard-pressed to be ready any earlier than, say, January,? Burch said, addingthat even mid-January could be a bit of a stretch. ?It?s looking more like a mid-Februarytimeframe is the right time for us.? Replacingthe 136-pound (62-kg) data formatter box should be relatively straightforward forAtlantis?s crew, requiring about two hours during one of the mission?s fiveback-to-back spacewalks to perform, Burch said. One cable connector and 10bolts need to be freed to remove the box from its mount, he added. Commandedby veteran spaceflyer Scott Altman, Atlantis astronauts plan to install a newcamera, replace gyroscopes and batteries, upgrade Hubble?s guidance equipmentand add a docking ring during their 11-day mission. Tricky repairs toinstruments never designed to be fixed in space are also on tap. The missionwill mark NASA?s fifth and finalshuttle flight to Hubble. Theastronauts were in the middle of an intense simulation on Monday when news ofthe delay broke, Shannon said. NASA hasnot formally set a new launch target, though the agency has called off aplanned flight readiness review that would have done so at the end of thisweek. In the off chance that the spare data formatter fails to pass muster,Atlantis could be primed to launch toward Hubble as early as late November. Shannonsaid that by the end of next week, shuttle mission managers should have abetter sense of what Atlantis? launch target will be. For everymonth NASA delays Atlantis? flight to Hubble, it adds an extra $10 million tothe space telescope program?s cost. But, mission managers said, the cost couldhave been much higher. ?Thinkabout if this failure had occurred two weeks after the servicing mission. We?djust put to brand new instruments in and thought we?d extended the life fromfive to 10 years and this thing failed after thelast shuttle mission to Hubble,? said Ed Weiler, NASA?s associate administratorfor science missions. ?We could have lost the mission in six, 12, 18 months. ?So in somesense, if this had to happen it couldn?t have happened at a better time,? headded. 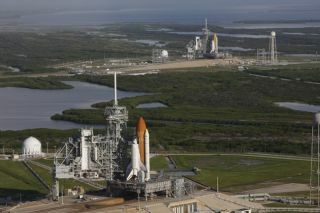 Atlantis?planned October flight was slated to mark NASA?s fourth of up to five shuttlemissions planned for this year. The mission was initially slated to launch inearly October, but slipped several days due to a series of setbacks caused byHurricane Ike and payload delivery issues. The agencylaunched three shuttle flights earlier this year to continue construction ofthe International Space Station, with the Endeavour orbiter slated to continue thatwork with a planned Nov. 16 liftoff. Shannon said that if Atlantis? missionslips into 2009 for sure, NASA will prepare Endeavour for its ownSTS-126 mission to deliver new life support and other equipment that willallow the station to double its current three-astronaut crew size. Meanwhile,NASA engineers at Goddard and their shuttle mission counterparts will work togetherto determine the best repair plan for Hubble. It was a similar effort, missionmanagers said, that allowed astronauts to fix Hubble?s blurry vision in spaceafter a mirror defect nearly doomed the space telescope in the early 1990s. ?Hubble hasa habit of coming back from adversity,? said Weiler, adding that the Hubble andspace shuttle team ?works miracles.? ?I?m not too concerned about this, we?llfind a way to get this fixed. Luckily, we have a spare. ?